I had Greek for lunch with my sister and a few of her friends! I highly recommend Jaffa for traditional Greek dishes, and Petra for modern Greek dishes. Since Greece is so close to the Middle East, some Greek restaurants will also carry Mediterranean and/or Middle Eastern dishes. I had the gyros (Greek) while my sister had the falafel plate (Middle Eastern). The falafel plate had pitas, hummus, salad, and tzatziki, in addition to falafel. It’s yellowish-greenish inside! This is because this particular falafel is made from green chickpea and deep-fried. Falafel (Arabic: فلافل‎) is a deep-fried ball or patty made from ground chickpeas, fava beans, or both. Falafel is a traditional Middle Eastern food, usually served in a pita, which acts as a pocket, or wrapped in a flatbread known as lafa; “falafel” also frequently refers to a wrapped sandwich that is prepared in this way. The falafel balls are topped with salads, pickled vegetables, hot sauce, and drizzled with tahini-based sauces. Falafel balls may also be eaten alone as a snack or served as part of a meze (appetizers). 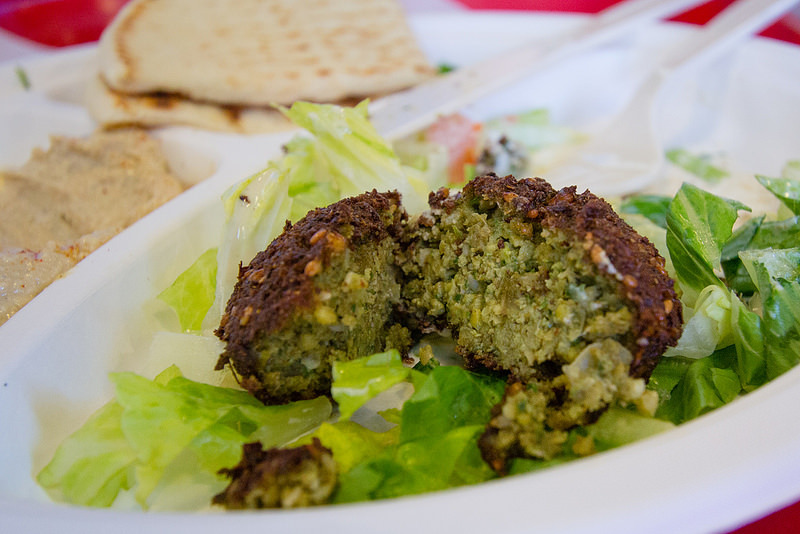 The origin of falafel is unknown and controversial. A common theory is that the dish originated in Egypt, possibly eaten by Copts as a replacement for meat during Lent. As Alexandria is a port city, it was possible to export the dish and name to other areas in the Middle East. The dish later migrated northwards to the Levant, where chickpeas replaced the fava. It has also been theorized to a lesser extent that falafel originated during Egypt’s Pharaonic Period or in the Indian subcontinent. Falafel grew to become a common form of street food or fast food in the Middle East. The croquettes are regularly eaten as part of meze. During Ramadan, falafel balls are sometimes eaten as part of the iftar, the meal that breaks the daily fast after sunset. Falafel became so popular that McDonald’s for a time served a “McFalafel” in some countries. Falafel is still popular with the Copts, who cook large volumes during religious holidays. Debates over the origin of falafel have sometimes devolved into political discussions about the relationship between Arabs and Israelis. In modern times, falafel has been considered a national dish of Egypt, Palestine, and of Israel. Resentment exists amongst many Palestinians for what they see as the appropriation of their dish by Israelis. Additionally, the Lebanese Industrialists’ Association has raised assertions of copyright infringement against Israel concerning falafel. Falafel plays an iconic role in Israeli cuisine and is widely considered to be the national dish of the country. While falafel is not a specifically Jewish dish, it was eaten by Mizrahi Jews in their countries of origin. Later, it was adopted by early Jewish immigrants to Palestine. Due to its being entirely plant based, it is considered parve under Jewish dietary laws and gained acceptance with Jews because it could be eaten with meat or dairy meals. Falafel is made from fava beans or chickpeas, or a combination of the two. The use of chickpeas is predominant in most Middle Eastern countries. The dish is usually made with chickpeas in Syria, Jordan, Lebanon, Israel and Palestine. This version is the most popular in the West. The Egyptian variety uses fava beans.